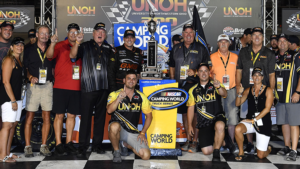 Johnny Sauter rolls into the NASCAR Camping World Truck Series playoffs with a stunning victory in the UNOH 200 on Thursday night at Bristol Motor Speedway. Driving the GMS Fabrication Chevrolet for GMS Racing, Sauter was trailing John Hunter Nemechek and seemingly headed for a runner-up finish. But Nemechek suddenly slowed, and Sauter shot past and into the lead for four laps to go. Sauter held off Stewart Friesen to secure his first Bristol victory. Sauter, the 2016 series champion, clinched the regular-season championship, and the 15 playoff points that come with it, by taking the green flag. He'll be the No. 1 seed entering the playoffs. 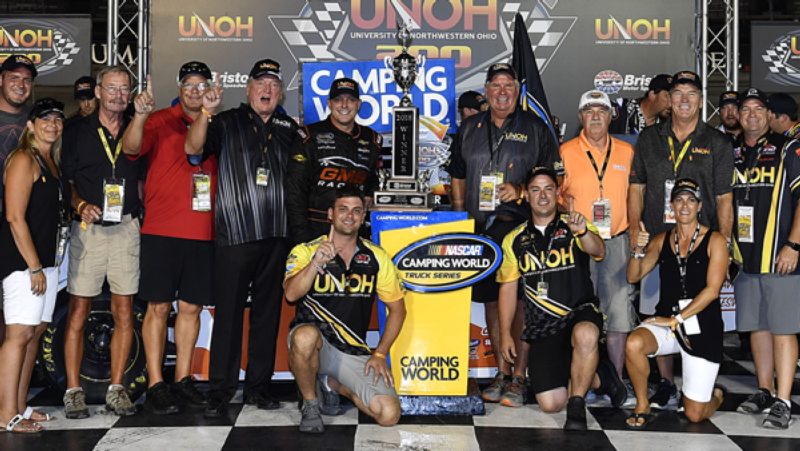 "I got a lot of trophies tonight: I got one for the (regular-season) championship, two for the win tonight - and a sword, all kinds of stuff," Sauter said. "Lot of hardware tonight, but I'll take it. This is so cool. I consider myself a short-track guy, and to get a short-track win at an historic place like this … this is the ultimate. This is such a cool place, and I'm just pumped up right now." Sauter, though, wasn't quite in the clear after getting by Nemechek. Sauter had battled Stewart Friesen for second place with 10 to go, swapping spots before Sauter re-secured second. Friesen inched toward Sauter in the final two laps but couldn't get closer than two-tenths of a second. The runner-up finish was the third of the season for Friesen. "We were racing hard there at the end," Friesen said. "Johnny did a good job holding me down so I couldn't get a good run off the corner - that's what you're supposed to do. That was it. I thought I had him pinched behind a lapped car, just gave him a little too much room. I gave him an inch, and he took it and got back by there." Nemechek led the most laps (104) but faded to third with engine troubles in the closing laps. "At a loss for words," Nemechek said on Twitter. "We put on a clinic tonight, led a ton of laps! Had motor issues at the end of the race while leading and came home third. Another one that slipped away! Learn from it and get better! Looking forward to the future." Parker Kligerman was fourth, with Todd Gilliland fifth. Sixth through 10th were Justin Haley, Ben Rhodes, Matt Crafton, Noah Gragson and Grant Enfinger. Enfinger clinched his spot in the top eight by starting the race, and Friesen secured the No. 7 slot in the second stage. The final position went to Crafton, getting his spot on points. Brett Moffitt will be second in the points standings entering the playoffs, followed by Gragson, Ben Rhodes, Friesen, Enfinger, Justin Haley and Crafton. Just missing the Truck Series playoffs were Myatt Snider and Dalton Sargeant. Nemechek took the lead on a restart on lap 32 and charged to the Stage 1 victory. Nemechek easily bested Sauter, Enfinger, Christopher Bell and Ben Rhodes. The stage win was Nemechek's fourth of the season. Bell, subbing for the ailing Harrison Burton, led the first 31 laps from the pole position but slipped back at the end of the stage. Nemechek dominated Stage 2, leading every lap and pulling away to beat Sauter, Brett Moffitt, Kligerman and Enfinger. The running order for the restart after Stage 2 was jumbled when Nemechek pitted for tires under caution on lap 116 - his first pit stop of the race. His stop was slower than the leaders who pitted with him, losing three spots. Sauter took the green for the final stage in first but Gragson slipped by on the restart. Sauter reassumed command with 69 to go and held the top spot for 45 laps before Nemechek got around Sauter in traffic. Sauter will take a 15-point lead into the first round of the playoffs at Canadian Tire Motorsports Park on Aug. 26. He's in the midst of a stellar season, winning a career-high five races thus far in 2018. "At the end of the day, we can only do our best," Sauter said. "If we do what we know we should do, execute and use the resources we have available to us, I feel like we'll put up a good fight. That's all you can ask for."